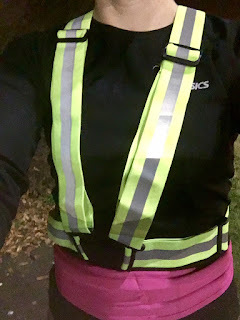 Dreaming of Footpaths: Tuvizo Reflective Vest: Look like a 90s Raver While You Run. Glow Sticks Optional. Tuvizo Reflective Vest: Look like a 90s Raver While You Run. Glow Sticks Optional. Tuvizo offered me this vest to review. As usually I've said exactly what I thought (90s raver) and took no payment (not even in creme eggs). First of all, vest is a misnomer for this piece of kit. 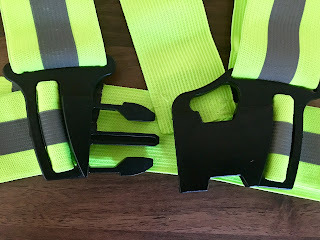 While it does the work of a vest, it’s actually an easy-to-use hi viz elastic strap system. It’s neon yellow but also has silver reflective strips so you’ve got the benefit of both at dusk and at full dark when there’s light to catch the strips. A brilliant piece of kit (spoiler: I may have liked this product! ), I really liked this for a couple of reasons: 1 - that you didn’t have to choose your kit around whether you’d be out when night fell - you could pop this on over your normal running kit and you wouldn’t notice it was there. It’s nicely adjustable and the straps are elasticated so it can fit snugly without flapping around and 2 - it’s just so VISIBLE. In the daylight you’ve got the hi viz yellow and when the cars start putting their lights on, you glow like a 90s raver. Brilliant for safety, whether you run with a club on the roads or whether you run on your own, you can be sure of being seen. As an additional benefit, the vest comes in a pack with 2 multi-purpose bandanas, also bright yellow and with the reflective strip across the middle. They're comfortable, highly visible and as everyone knows you can’t have too many neck warmers! 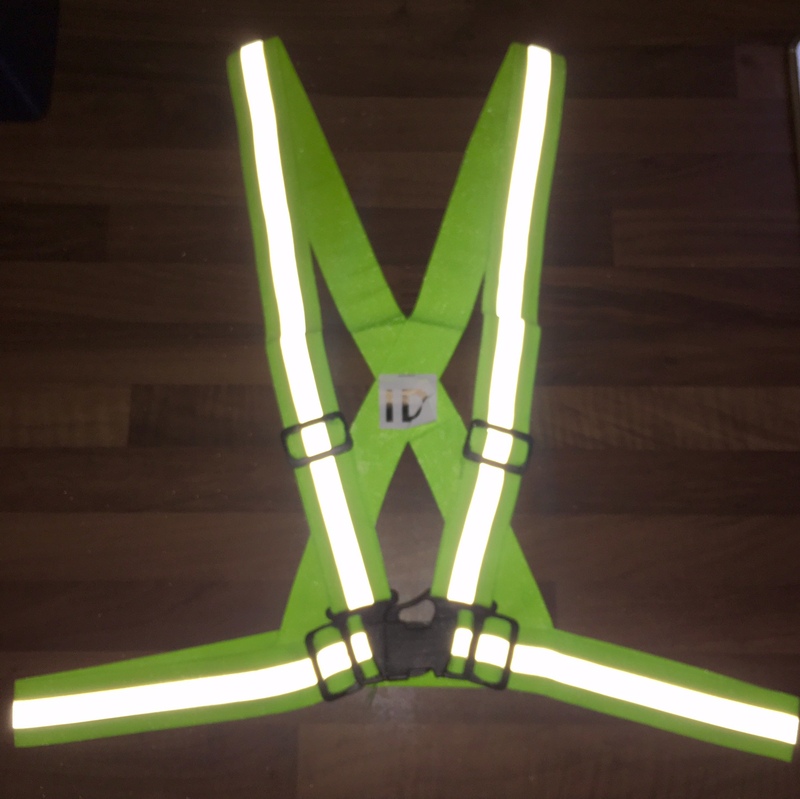 The hi-viz vests come in 3 sizes, but are very adjustable and easy to make comfortable. Another benefit of the vests is that over the years I've collected some lovely run tops which I can’t wear in winter as they’re too dark coloured and therefore not visible enough. It’s frustrating - they’re lovely and comfy but black with long sleeves is no good for the gym (too hot!) 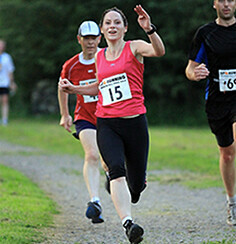 or winter running (too dark!) but I can stick my hi viz straps over the top and wear it without worrying about not being seen by other road users. Same with some of my darker cycling jerseys. 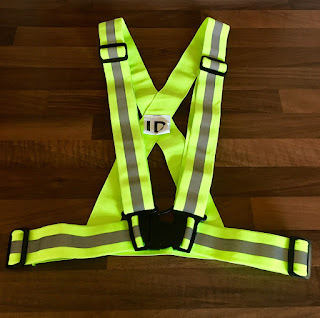 I suspect that this reflective vest is going to be a favourite piece of kit. It has an easy open clasp which really makes a difference to me as every winter with cold hands I manage to shut fingers (or even more painful - BITS of fingers) into clasps, buckles and zips so anything which makes it less easy for me to bleed is a winner in my book. You can get your own from Amazon (details at bottom of post) or you can win one here. For a chance to win email me a winter running pic and I’ll tweet out the winning picture and send you a Tuvizo Hi-Viz pack containing a Hi-Viz Vest and 2 Multi-Purpose Bandanas!